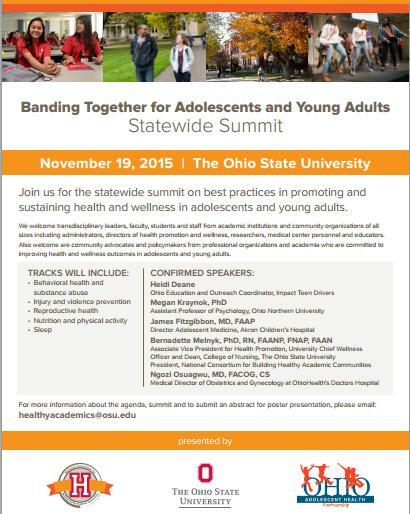 The National Consortium for Building Healthy Academic Communities, the Ohio Adolescent Health Partnership, and The Ohio State University collaborated to bring the 2015 Banding Together for Adolescents and Young Adults statewide summit on best practices and promoting and sustaining health and wellness in adolescents and young adults. We welcomed trans-disciplinary leaders, faculty, students and staff from academic institutions, schools and community organizations of all sizes, including administrators, directors of health promotion and wellness, researchers, medical center personnel and educators. Also welcomed were community advocates and policymakers from professional organizations and academia who are committed to improving health and wellness outcomes in adolescents and young adults. Visit our Facebook Page for highlights and photos of the summit.